IMG_1726, originally uploaded by Craftydiddl. Today we just have some good ‘ol stockinette socks. And while many of you can crank these out in days-i still need over month but mainly because i have so many other projects going on and i start to feel guilty if i neglect them. Yarn: Scout’s Swag in Fruit Salad-i bought this a long time ago right before she closed her etsy shop for a bigger and better shop-not sure if she still has this color-way. Notes: I got nothing-easy, straight forward and no problems. Next for socks-Some for Little Man, they don’t count toward summer of socks but i am still knitting socks so that works for me 🙂 but i have a few other things i want to finish before starting them-i want to be able to concentrate because i will be attempting to do 2 at once on one Circular needle. I love the “salad bowl” colorway! So summery!! 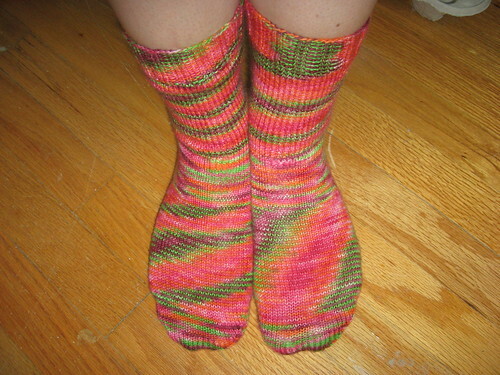 Keep knitting those summer socks! Your shawl and socks are lovely. It’s amazing how much one can get done when one has no distractions. I spend so much time with distractions. It’s a wonder I get anything else done.